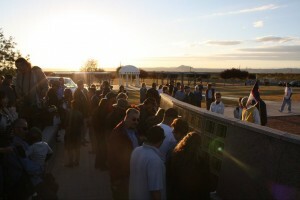 The Las Cruces Veterans Memorial Wall is an impressive installation at Veterans Memorial Park. 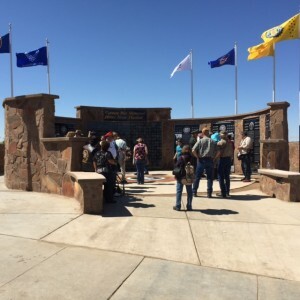 The wall not only memorializes the names of state and local veterans throughout our nation’s history, the park itself is a walking tribute to our area’s history of service. 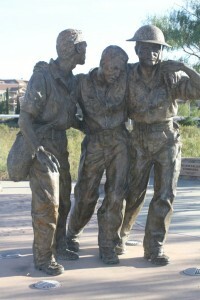 Since so many New Mexicans were part of the Bataan Death March, the park’s memorial walking trail tour is anchored a sculpture titled “Heroes of Bataan” by local artist Kelley S. Hestir. The memorial walking trail features four memorials at this time: the Korean War, Marine Corps League, the Vietnam War, and the Disabled American Veterans. There are also special memorials giving recognition of service to women veterans, WWII veterans, veterans of the China Burma India War, and the Special Forces, with more to come. These monuments are located throughout the memorial park along the walking path. 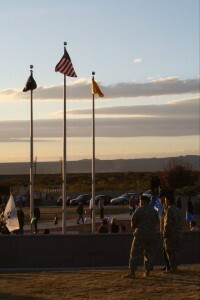 The New Mexico Department of Veteran Services and the New Mexico Department of Cultural Affairs have been two of the driving forces behind a long-planned project to build the New Mexico Veteran’s Museum to preserve the state’s rich military history. 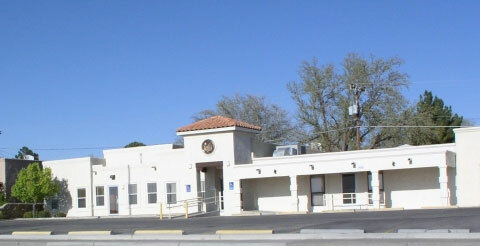 The proposed 33,000-square foot facility is proposed to be built in Las Cruces on 33 acres.